The year of 2018 is (almost) over and we wanted to recap this magnificent year of water polo. Olympiacos won Group A confidently with only one loss and one tie. Jug Dubrovnik, Barceloneta and Brescia finished with only one point difference from each other and they all advanced to the Final 8. Pro Recco was as dominant as Olympiacos, they won Group B with only one loss. Two Hungarian teams Eger and Szolnok finished second and third, while Spandau finished fourth to advance to the Final 8. The Final 8 was held in Genova between the 7th and 9th of June. Olympiacos had a tough time against Spandau, but three of the four teams from Group A won with the only exception of Brescia, who was beaten by Pro Recco. The Greeks beat Barceloneta 6-4 and the Italians beat Jug 9-8. In the final Olympiacos managed to win 9-7 against Pro Recco to take home the gold medal and the trophy. In the quarterfinals of the LEN Euro Cup Ferencváros, Marseille and Sport Management won twice against their respective opponents, while Miskolc advanced on goal difference after first beating Spartak Moscow by four and then losing by three. Ferencváros won the Hungarian derby convincingly in the semifinals, while Sport Management advanced narrowly against the French team. The Hungarians delivered two wins in the finals (9-8 and 8-5) and celebrated their second Euro Cup gold medal a row. The women’s World League Super Final was held between the 28th of May and the 2nd of June in Kunshan, China. USA was unstoppable winning the group stage with a goal difference of +21. In the quarterfinal they won by 11 against Australia and by 5 against Russia in the semifinal. The final against the Netherlands was their toughest game but USA won 8-6 after being down by one after the first quarter. The bronze medal was taken home by Russia while Canada finished fourth. 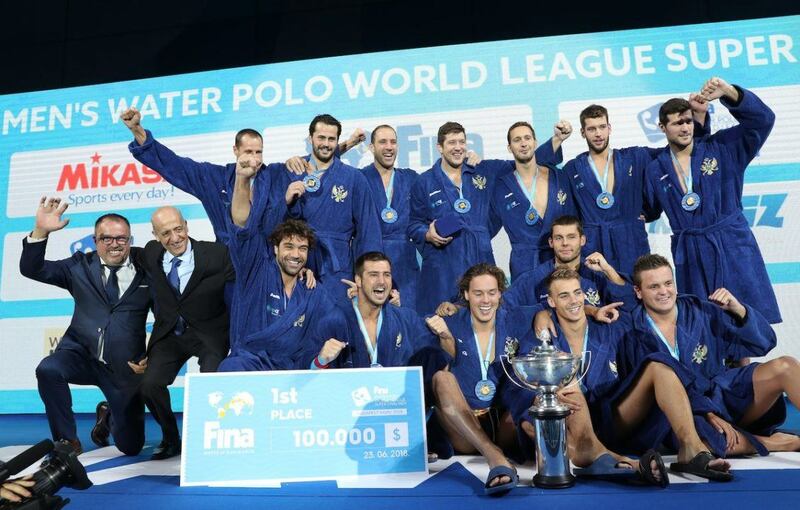 Held in Budapest between the 18th and 23rd of June, the men’s World League Super Final offered a lot of thrills. Group A’s fourth placed Japan upset Group B winner USA in the quarterfinals (11-10) and Hungary beat Croatia on penalties in the game of the day. Montenegro and Hungary advanced to the finals after that and the hosts lost on penalties in the final. Spain took third place and Croatia only finished fifth. The women’s World Cup was held in Sergut, Russia between the 4th and 8th of September. USA and Russia dominated their games until they met in the final. The only close game for the two national teams was the semifinal between Russia and Australia, a low scoring game was won by the home team 5-3. In the final USA managed to get up early and keep their lead throughout the game to take home another trophy to their cabinet. Australia finished third, Spain fourth and Canada finished fifth after an amazing penalty shootout, they beat China 10-9 just on penalties (20-19 overall). Berlin was the home for the men’s World Cup between the 11th and 16th of September. Group A was really interesting as three teams finished with four points (Germany, Hungary, Australia). In Group B Serbia and Croatia tied and finished with 5 points each. All three aforementioned teams won in the quarterfinals from Group A, the closest was Australia’s 9-8 win over Croatia. The semifinals were both really close, one goal decided each game. Hungary beat Serbia 12-11 after being down by two after the first period, while Australia beat Germany on penalties. The final was a landslide, Hungary beat Australia 11-4, while Serbia beat Germany 15-9 for the bronze medal. The European Championship was held in Barcelona between the 14th and 28th of July. The Netherlands, Greece, Italy and France advanced from Group A, while Spain, Hungary, Russia and Germany advanced from Group B. Spain and the Netherlands won easily in the quarterfinals, but Hungary and Greece had a really tough time and only won by one against Italy and Russia respectively. The Netherlands beat Hungary by two and Greece beat Spain by two in the semifinals. The Netherlands won in the finals in a low scoring matchup (6-4) and Spain finished third. Italy, Spain, Croatia and Serbia won their groups respectively in the men’s European Championship in Barcelona, while Hungary, Montenegro, Greece and Russia also advanced to the quarterfinals. There were no upsets as all four group winners got a win and went on to the semifinals. As expected all the remaining games were close. Serbia beat Croatia by 2 and Spain beat Italy by one. In the final Serbia came out victorious after a 12-10 score.